This article was written by VR/AR Association's Education Committee and features examples from Association members. Thank you to our sponsor CingleVue. VR and AR technology is rapidly evolving and is beginning to impact many fields and industries. VR has the potential to immerse audiences, capture attention and dramatically reveal and showcase crafts, skills, sciences and systems in very memorable ways. It can transport students into real-world or simulated locations or simulated environments, and interactively test and record their skills and reactions in a wide range of situations. VR and AR can be used to invite world-renowned experts into the classroom, and introduce exhibits and examples that might be otherwise too costly, rare, destructive or hazardous to actually bring into the academic environment. Both technologies can be leveraged to overcome issues of risk, time and scale, allowing students to experience situations, processes and phenomena that might be difficult to perceive or observe in physical reality. Today, educators can provide experiential learning without ever having to leave the classroom. Companies like VReducation have built VR experiences that take the concept of ‘learn through experience’ seriously. The company, based in Waterford, Ireland, created an education platform called ENGAGE that gives students and teachers the ability to communicate in a safe, virtual environment. The system allows up to 30 users into an experience at a time and has virtual assets such as presenter tools, interactive whiteboards, and streaming media features to keep things focused. The company’s Apollo 11 VR experience has already won multiple awards, and the upcoming Titanic VR is set to debut later this year. Schell Games is one of the largest independent game studios in the US, and it aims to bridge education and entertainment. With support from an IES SBIR grant, one of their experiences is called SuperChem VR, a VR chemistry lab that feels every bit as tactile as its real world sibling. Students can perform specific measurements, conduct real lab procedures, and get real-time assistance. SuperChem VR prototype currently runs on the HTC Vive to allow for maximum hand and body movements in the learning space. The high-quality hardware allows players to focus on realism and accuracy without sacrificing visual and gameplay quality. WebGuyz provides educational experiences through VR AR. Currently, Webguyz is partnered with NYC Dept of Education, UFT, NYIT, and Jump into the Light as well as Cisco Netacad to make VR and MR accessible to public as well as private school students. WebGuyz has created VR/AR experiences and curricula that are fully aligned to the common core and NY State Regents Examinations. Students are learning animation development and web development for VR, along with VR cyber security training. 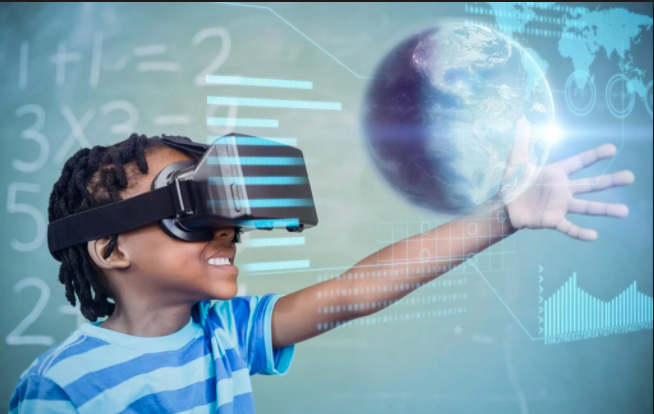 With more and more opportunities being developed for e-learning, WebGuyz is excited to clearly see VR/AR at the forefront of experiential education. SmartEducationLabs (SEL) is a platform for educational services from ONE Digital, which includes VR & AR. SEL is compatible with traditional, multimedia and smart classroom lessons, and is used as a complement and not as a substitute for current systems. Some Schools in Emirates and Spain are already working with SEL. In 2016, The Ministry of Education of Emirates, implemented a Learning Resources Centers (LRC) Program in schools. Every LRC is equipped with VR/AR devices. The software suite includes virtual learning worlds complement text and pictures with a 3D experience. Head of Digital Learning and Innovation at JESS Dubai, Steve Bambury, uses VR headsets for use across the curriculum and staff regularly harness applications like Nearpod, Google Expeditions and YouTube 360 to share content with students. JESS continues to pioneer and seek new opportunities, running pilot schemes for LifeLiqe in Science, Kubity in DT and ImmerseMe in the Modern Foreign Languages Department. Another key pilot scheme has been Timelooper, an amazing VR platform for learning about history that transports students back in time using a clever mix of re-enactments and digital effects. Timelooper is primarily being harnessed in Key Stage 4 with GCSE students but younger students have also been able to engage with some truly unique experiences such as the Year 6 students who travelled in time to experience The Blitz in WW2. Founded by pioneers from education, robotics and game production, RealCast is using VR AR to fundamentally transform our relationship with history and culture. Based out of Paris’ Station F (stationf.co), the company develops new forms of multi-user interaction in VR AR to create seamless interactions between historical characters, settings and artifacts so as to powerfully enhance users' understanding of bygone times. Its first In Situ Experience (ISXP) use-case provides interactive AR experiences via HoloLens for medieval castles with leading international educators and scholars as content and storytelling advisors. In addition to high-level content, RealCast is also developing a platform which will serve as sort of "time machine" for developers to build their own VR AR content with the aim of bringing history alive in powerful and unprecedented ways. Transmersive Media and Exposition Online, Inc is developing linear, interactive and location-based VR AR exhibits and attractions. Two such educational VR AR exhibits include NightLife and Windows on the Past developed in collaboration with Playground Media Group and Red Gypsy Animation for the Las Vegas Springs Preserve. In NightLife, students and museum guests gaze out a large simulated window through mounted, swiveling, “Night Vision Goggles” searching for and capturing images of nocturnal desert wildlife. Virtual expedition guides, appearing on a large monitor describe and explain the nature and unique habits of the various animals as they are virtually encountered. Windows on the Past employs AR technology to restore and bring to life the native inhabitants and culture of an ancient puebloan ruin. Museum guests explore the reconstructed physical pueblo, then, gazing through augmented reality windows, they see the pueblo as it might have looked during its use and occupation many centuries before. The current rapid accelerations in VR devices and technology have made it possible to economically deliver similar types of immersive learning experiences into every modern school and classroom. The Center for Digital Media, Royal BC Museum, University of Victoria, and QVirt are developing installations for the soon to be opened Student Learning center in Victoria British Columbia. In these early days of educational VR applications, it is critical to establish best practices for exploring quantitative and qualitative data revealing the subtle relationship between virtual experiences and learning. We are building on previous research that explores quasi-experimental ways of measuring successful VR experiences through various knowledge pre- and post-tests for measuring content knowledge [1, 2]. We are combining these with surveys to measure the VR experience in general . Still other researchers have measured presence, immersion, and flow as a way of understanding immersion and interaction, which can lead to learning [4, 5]. There are several survey questionnaires that have been developed and validated that would be appropriate for measuring learning, such as the Presence Questionnaire and the Immersion Tendency Questionnaire [5, 6]. Presence is described as a “psychological state of being there mediated by an environment that engages our senses, captures our attention, and fosters our active involvement” . Immersion is also a psychological state and can be characterized as “perceiving oneself to enveloped by, included in, and interacting with an environment that provides a continuous stream of stimuli and experiences” . Flow is a state where “people feel involved in meaningful actions, maintain a sense of control and stay focused on a goal” . The flow experience “seems to occur only when a person is actively engaged in some form of clearly specified interaction with the environment” . Similar to presence and immersion, flow is focuses on active engagement within an environment. For example, Bressler and Bodzin  used a short flow state scale to measure flow in a post-survey with students. 1. Chen, C.-T., Development and evaluation of senior high school courses on emerging technology: A case study of a course on virtual reality. Turkish Online Journal of Educational Technology - TOJET, 2012. 11(1): p. 46-59. 2. Hauptman, H., Enhancement of spatial thinking with virtual spaces 1.0. Computers & Education, 2010. 54(1): p. 123-135. 3. Tcha-Tokey, K., et al., Propostion and validation of a questionnaire to measure the user experience in immersive virtual environments. The International Journal of Virtual Reality, 2016. 16(1): p. 33-48. 4. Bressler, D.M. and A.M. Bodzin, A Mixed Methods Assessment of Students' Flow Experiences during a Mobile Augmented Reality Science Game. Journal of Computer Assisted Learning, 2013. 29(6): p. 505-517. 5. Witmer, B.G., C.J. Jerome, and M.J. Singer, The factor structure of the presence questionnaire. Presence: Teleoperators and Virtual Environments, 2005. 14(3): p. 298-312. 6. Witmer, B.G. and M.J. Singer, Measuring presence in virtual environments: A presence questionnaire. Presence: Teleoperators and Virtual Environments, 1998. 7(3): p. 225-240. 7. Csikszentmihalyi, M., Flow: The psychology of optimal experience. 1990, New York, NY: Harper and Row.